One week into our Park-A-Day KaBOOM! Summer Challenge, our challengers are off and running! Well, the kids are running, and the parents are doing their best to catch up. 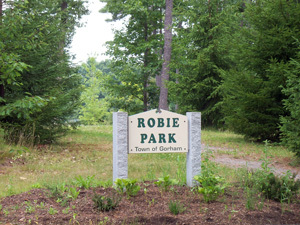 "Robie Park features a playground, community garden, and baseball field. I was greeted with a profane message in silver spray paint on the side of the playground equipment. I called the Rec Department, and they thanked me for the head's up. To my surprise, not five minutes had passed before a staff member pulled up and started scrubbing the graffiti away. I guess it helps that the municipal offices are right next door to the park, but I hadn't expected such a quick response." "On day three of the Park-A-Day Summer Challenge we were visiting family in Pennsylvania, so I took five children, ages 14, 10, 6, 5, and 4, to the park down the street. WOW!!! No prefab commercially produced playground equipment here! 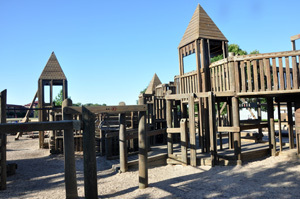 The entire HUGE area is built of wood and tires and has every possible playground element you can think of, plus more! From a distance it looks like a castle with many turrets. My boys said, 'How come we don't have a playground like this back home?' That's quite the compliment from a teenager and tween." "Life with a 5-year-old is never slow. It is filled with jumping, running, hide and go seek, fireflies, and wonder. On Monday, we cooled off and went to see Toy Story 3, which reminded me of how short childhood can be! This is the main reason I took on this challenge. After the movie we all stopped by our local elementary school, Still Elementary, to check out our new playground. 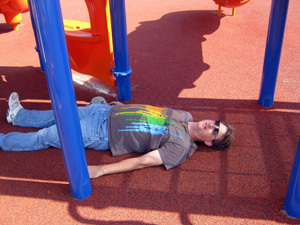 It was very very HOT, so Daddy found the best playground spot under the playground equipment." Marily Smith started the challenge by visiting a playground we helped build! "We started our Park-A-Day challenge at Park of the Canals because the playground was built by KaBOOM!. 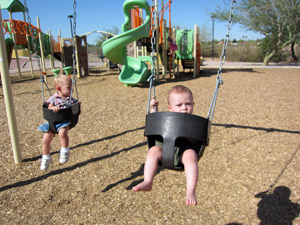 In addition to the fun play equipment, this park also has a desert botanical garden where you can learn about different varieties of desert plants. Most importantly, the park is built around ancient Hohokam Indian canal systems. There is a trail you can follow to see some of the canals. Great place to play and learn!" Meet the rest of our challengers and follow everyone's adventures in our Park-A-Day Summer Challenge Group.